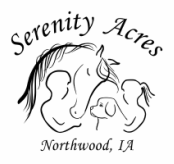 Serenity Acres is an IRS recognized 501c3 public charity, offering therapeutic riding and other animal assisted therapies to clients who do not have this opportunity, whether due to physical, mental, or emotional challenges. Our primary goal is to share the unconditional love and acceptance most effectively offered by animals and to show our clients the wonderful ways we can interact with animals to enhance our lives and theirs. "The Mission of Serenity Acres is to enrich the lives of children and adults, primarily those with disabilities, through therapeutic riding, horsemanship, and animal-assisted therapy programs."